Synopsis: The story revolves around United Nations employee Gerry Lane (Pitt), who traverses the world in a race against time to stop a pandemic that is toppling armies and governments and threatening to decimate humanity itself. You know that your favorite pop culture phenomenon has really hit the big time when it can attract an A-list Hollywood celebrity into its fold. It doesn’t get much more A-list than Brad Pitt (Se7en, Fight Club), so it would appear that the zombie apocalypse has arrived with World War Z. World War Z finds the Earth in the midst of said zombie apocalypse. Pitt stars as Gerry Lane, a retired United Nations Specialist who is forced back into service in an effort to find a solution to the problem. After narrowly escaping from a zombie siege in his home town of Philadelphia, Gerry leaves his family on a safe ship while he jets around the world to places like Korea and Israel that are under attack in hopes of putting together clues that will lead to an eventual vaccination or cure for the “virus” that is turning the people of the world into zombies. Based on the novel by former “Saturday Night Live” writer Max Brooks, the screenplay for World War Z has been tweaked and reworked by heavyweight Hollywood script assassins such as J. Michael Straczynski (Thor, “Babylon 5”), Damon Lindelof (Prometheus, “Lost”), Drew Goddard (The Cabin in the Woods), and Matthew Michael Carnahan (The Kingdom). Despite all of the rehashing, director Marc Forster (Quantum of Solace, Monster’s Ball) still gets stuck with a problematic script that seems like a cheap combination of Contagion and I Am Legend. The finished picture seems to echo the uncertainty of the production process; the entire narrative lacks focus, purpose, and depth. It’s pretty much a straight shot storyline, with little deviation and zero subplot. It is much more of an action film than a horror movie or medical thriller, but it isn’t exciting enough to generate a lot of interest from the viewer. There are some genuinely tense and suspenseful moments in the third act, but by the time the film gets there it’s too little, too late – the audience is already thinking about what to grab for dinner later. 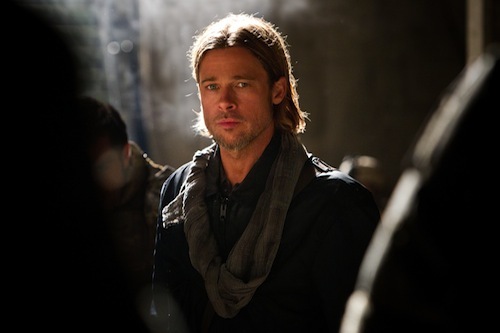 World War Z puts a lot of pressure on Brad Pitt. 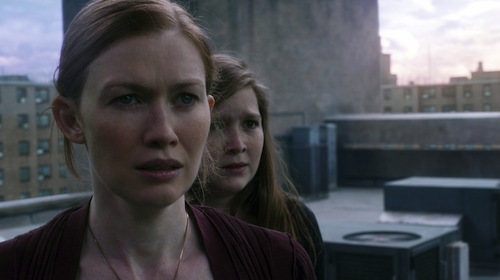 Although Mireille Enos (“The Killing”) gets some screen time as his wife and Daniella Kertesz (“Loving Anna”) joins in as an Israeli soldier, Pitt’s Gerry is really the only main character in the narrative. Pitt’s performance is good, but the character is not nearly as interesting as, say Fight Club‘s Tyler Durden or Inglourious Basterds‘ Aldo Raine, so he comes off as restrained and generic. Pitt is up to the task of carrying the movie, but the movie is not willing to be carried by him. The idea of a worldwide zombie pandemic was an original one – back in 2006, when Brooks’ book was new and long before “The Walking Dead” became a household word. Now that zombies are everywhere, World War Z is just another drop in an overflowing bucket. The camera work in World War Z is tedious and confusing. Shot by cinematographer Ben Seresin (Transformers: Revenge of the Fallen), the film is a crazy combination of sweeping, CG-laden establishing shots and dizzying, neck-snapping action sequences, neither of which are very effective. The long shots are too artificial looking to give the viewer any sense of what’s going on in the world of the film. The action segments are equally frustrating, but for the opposite reason; they’re shot way too tightly so the audience has no idea what they are actually looking at. The film’s photography is hampered further by the unnecessary use of 3D effects, all of which do absolutely nothing to improve the look or feel of the film. 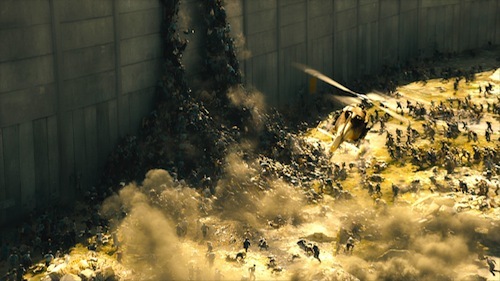 For as much money as the film cost to make, World War Z should at least look great. It doesn’t. To be honest, World War Z is not a horror film, so it cannot be expected to be horrifyingly frightening. However, it is a zombie movie, and a certain standard should be upheld as such. While it is nothing to lose sleep over, the film does have its moments. The zombies are closer to the swift, athletic undead in films like 28 Days Later than they are to the brooding, shuffling walkers in Night of the Living Dead. The zombies in World War Z are swarming and flocking, moving together like they are of one mind similar to a school of fish or a flock of birds. The sheer number of them and their unrelenting tenacity make them formidable antagonists, even if their anonymity and facelessness keep them from really having a relatable presence onscreen. The zombies are good for a few jump scares, and there are a few cringe worthy moments spread out, but there’s nothing too scary in World War Z. It’s more action than fright.